"Reusable Products For The Medical Waste Industry"
"Our mission is to provide a complete line of ingenious, high quality medical waste products that enhance our clients' abilities to deliver superior products and services to their customers for years to come." 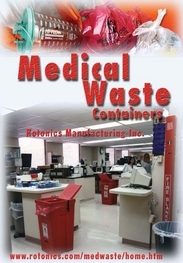 PCM’s medical waste division has been assisting companies with their medical waste management for many years. We can make custom products to meet your specific needs. Not every facility is the same and this can make it difficult to find the medical waste disposal equipment that you need. We sell our products to independents in the medical waste management industry, including the largest medical waste companies in the world. PCM provides a large array of custom products to help you to resolve your medical waste management issues. 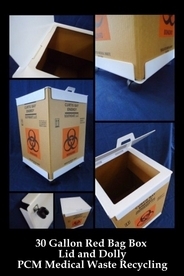 Everything from sharps containers, to hands free sharps container tippers, to custom hands free Red Bag Box dollies to reduce exposure to needle sticks and other hazards. PCM Precision understands progress. Product designers work hard to think of every possible way to make their products better, but we all know that it is impossible to think of everything. Have you ever thought to yourself, “I really like this product, but it could be better if …”. Let us know! We are not limited to making the products that you are used to seeing in your office. If you have a product that you think could be better if you made some minor or even major changes, our engineers can will work with you to redesigning your current product(s) to make a custom version and hopefully make your office more efficient and safer. PCM Precision has decades of experience fabricating medical waste tippers, washers, step on carts and dollies for the Medical Waste and the U.S. healthcare industry. We are committed to providing superior service and value to our clients as well as independent medical and Rx waste facilities worldwide. PCM Precision has developed long term relationships with a variety of clients including Curtis Bay Energy, and Waste Management. Our products are in HCA, Kindred, HMA’s, The Mayo Clinics, and 100’s of Independent Medical Waste facilities across the United States. Once facilities use our reusable container system they never go back to disposable single-use containers. Reusable containers are used internationally and require tipping/dumping and sanitation. Our Red Bag Box Dollies are a patented recycled HDPE plastic cart designed to cover red bag medical waste boxes. The lid was designed to make it easy to open even with both hands full. The four caster wheels make the dolly easily movable on any standard hard flooring. PCM Medical Waste has recently teamed up with Rotonics Manufacturing Inc., a rotational molder, engaged in the research, engineering, design, and manufacture of plastic products. You can visit the Rotonics website and see what they have to offer you. You can also take a look at a Rotonics brochure by clicking on the poster to the right. 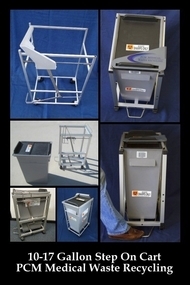 We also manufacture a hands free step on cart that holds a 10 or 17 gallon Rotonics container. PCM and Rotonics are working together to provide the best quality products on the market. reusable medical waste containers, hands free medical container tippers and washers, baskets, lids, wall mount brackets and cabinets, vent lab hoods, Rx sorting tables, medical instrument reprocessing tables, step on dollies, Nexel medical waste transport carts and custom cart covers and more. Stainless steel, aluminum and plastic products, as well as custom fabrication, tool & die PCM is a products vendor for independents as well as the largest medical waste companies in the world. © 1994-2011 All rights reserved.